Automatic thickness gauging and time-of-flight measurement with ultrasound is often used for the measurement of part geometries for quality control and in process control. In this field and other fields of thickness gauging a big step forward was possible by making use of software and hardware technologies developed for general PC application. The enormous progress in hardware as well as new software architectures such as client-server, OLE and other standards developed for WINDOWS also initiated an amazing progress in the world of NDT. This paper will give an overview of these systems and show with some selected examples the widespread applications. A modular multichannel thickness gauging system was developed for the increasing number of applications requiring the precise automatic measurement of part dimensions. 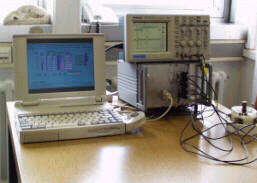 It can also be used for in process control and quality verification. It can be easily tailored to specific requirements at reasonable cost. This modular system comprises an 8 channel ultrasonic thickness gauge. It may be controlled by the ISA96 bus of an industrial 19" PC or by a standard serial interface from a remote PC or laptop. 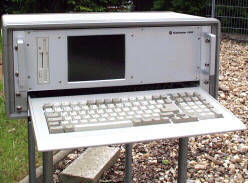 The thickness module is operated with standard software packages for the setup, for data acquisition and for evaluation. Geometrical parameters such as excentricity or ovality and statistical values such as average, standard deviation and others are calculated in real time. Event signals from various thresholds/gates are available in real time at parallel outputs and can be directly used in SPC systems for closed loop process control, for instance for plastic pipe extruders. The standard software interfaces and drivers are designed in accordance with Microsoft's WINDOWS standard. So the operator surface, i.e. the presentation of results and special evaluation routines can be designed to the customer's demand by use of user-friendly software development tools like Visual Basic. Due to the WINDOWS environment, the transfer of inspection results into EXCEL or ACCESS is very easy for quality assurance purposes. Integrated inspection systems based on this modular principle will become a "must" in future. Time and cost for design, verification and implementation increase dramatically with increasing complexity of testing systems. These systems can only be offered at a reasonable price if readily available industrial standards are used as show here. with 4 or 8 probes arranged statically around the tube with a multichannel system for quasi simultaneous measurement of the wall thickness. with multi element arrays around the tube connected to the appropriate UT system. The onboard controller evaluates for minimum and maximum thickness and calculates excentricity and ovality of the tube. Production statistics are also performed on the PC as average and other quality factors. Event outputs and analogue outputs are given in real time. 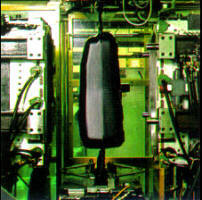 Automobile tanks are manufactured using the blow mould technique: A tube is extruded into the blow mould and than blown into the mould to get the shape. The process starts with relatively hot material. The mould is equipped with a means for cooling the material down. The mould may not be opened before the tank is cooled to a temperature where the structure is stable. The temperature of the plastic during the cooling must be observed for process optimization. A multichannel thickness gauge measures the time-of-flight at a number of critical spots. The ultrasonic probes have a delay line which is screwed and glued into a hole in the mould. Then the surface of the delay line is ground to fit to the shape of the mould in order to avoid marks on the parts. The thickness of the material is relatively constant during the process. Therefore, a change in time-of-flight is caused by the sound velocity which varies with temperature. 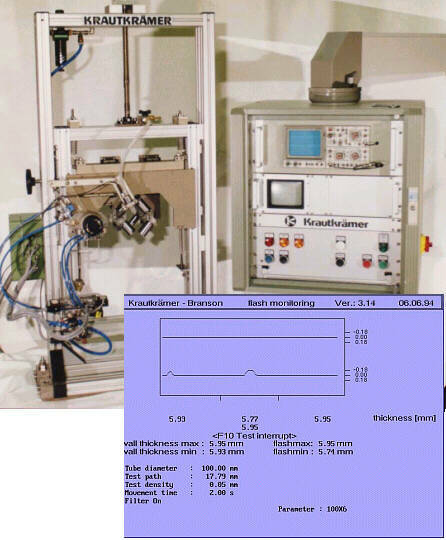 The velocity change is recorded and evaluations for optimizing the process parameters are performed on the host PC. The complete system may be embedded into a quality assurance system via the network. In ERW welded tubes the inner and the outer weld are scarfed online to give a smooth tube contour. This scarfing process is controlled via thickness gauging with an ultrasonic squirter probe oscillating across the weld and the PC based thickness system. For economical production of thermo plastics without loosing the required quality, it is extremely important to observe the curing process on line in the mould. 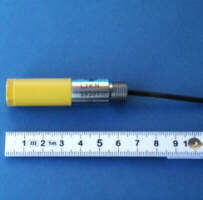 For this purpose a method was developed in a common research project led by BAM (German Materials Authority): A number of ultrasonic probes are integrated into the mould and measure the sound velocity in a through transmission mode. As the diagram shows there is a characteristic shape of the sound velocity curve over time. 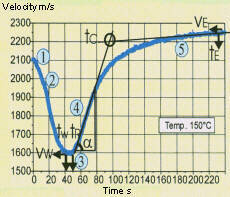 From this curve, the point in time is calculated when the maturing process is finalized and the mould is opened. The moulding machine is controlled on line from a single channel PC controlled thickness gauge for single moulds with only one measuring point. Normally one mould contains a number of parts and every part has to be controlled individually. In this case or if a number of moulding machines have to be controlled, the multichannel system is economically best suited for this task. 5. Process control in GAIM "Gas Assisted Injection Moulding" and WAIM "Water Assisted Injection Moulding"
The GAIM technique was developed for the economic production of plastic parts containing cavities or bore holes. First the mould is filled with the nearly liquid polymer. Then water or gas is pressed into the mould. Since the polymer freezes at the borders to the mould, only the center portion is pressed into the mould or back into the extruder. This method is used for many parts such as complex tubing structures, the automotive industry or housings for computer, TV sets etc. For achieving high quality parts it is necessary that the gas injection process is observed at a number of different places of the mould. The velocity of the gas bubble has to be measured for predicting the time when the gas bubble reaches the end of the mould and the injection has to be stopped. Furthermore the time of flight through the wall is measured for observing solidification of the polymer material and determining the time when the mould has to be opened. Both tasks are resolved by mounting ultrasonic probes into the mould. 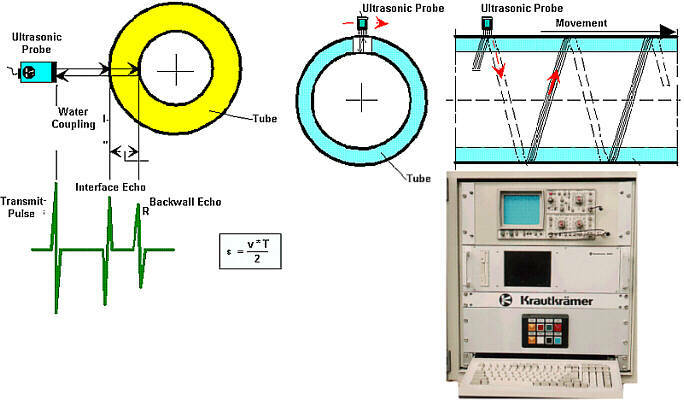 By means of a gate, the time is measured when the bubble passes the probe position and after that the delay time to the backwall echo is measured and stored continuously. The shape of this cooling curve is evaluated. The results are used for on line process control. 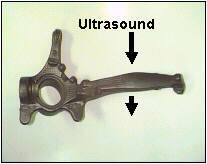 More and more parts were manufactured in a casting process instead of forging because of lower production cost. The required ductility of the part is only achieved if the nodularity is sufficient i.e. the portion of spherical graphite grains is high enough. The sound velocity in the material is directly related to the elastical parameter of the material. For critical parts in the automotive industry the method of measuring the sound velocity to prove the ductility is fully accepted and very often used for quality control. Thickness gauges allow the measurement of sound velocity just by measuring the time of flight, calculating the velocity as thickness divided by velocity. With a special PC based system it is possible to measure thickness and velocity simultaneously in a through transmission mode. It is possible to measure a number of different spots on a part simultaneously if a PC controlled multichannel systems is used. In this case the PC also allows the selection of good and bad parts, does production statistics and may be connected to a quality assurance system by the network for statistical process control.